Hollywood studios run expensive, sophisticated campaigns to try to woo Oscar voters. So why do they still bother with billboards? But why is that billboard asking me, and most other Angelenos, to consider something that we cannot vote for? A hundred and forty-five thousand people or so work in the entertainment field in Los Angeles, only about six thousand of whom cast ballots for the Academy Awards. There are more people working here in finance, I.T., education, health care, food services, and even building and grounds maintenance; the University of Southern California employs some thirteen thousand people, a few thousand more than Disney, L.A.’s largest employer in the entertainment industry. In that sense, the billboards seem to serve as a reminder of the industry’s incredible self-regard. 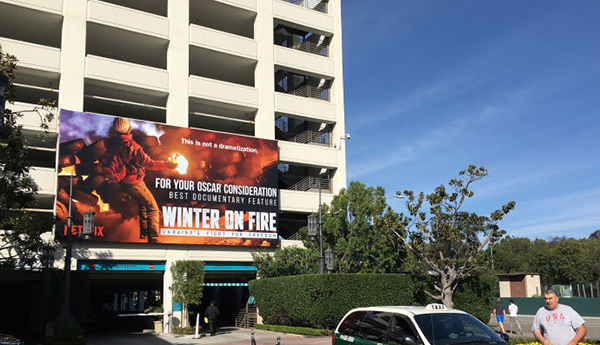 The billboards also play a less-direct role in propelling Oscar campaigns from critical acclaim to nomination to victory to additional box-office returns by taking advantage of the fact that many of those who work in the L.A. industry have outsize cultural influence in the country as a whole. Ira Kalb, who runs a marketing consultancy and teaches at U.S.C., identified for me the crucial lubricant in the publicity machine. “This is Hollywood, so vanity is involved,” he said. A billboard is a very visible, localized way of showing the love and support that actors, directors, and others involved in film production crave. That then sparks them to invest in their own publicity apparatuses—appearing at extra screenings and events, sitting for interviews and photo shoots—which increases their chances of winning a little golden man or globe, or a little bronze man. “The talent sees you, the studio, are investing in him, and they’re doing the same. The rule of thumb, for talent, is that they pay their publicity people double during awards season,” he said. Vanity might seem trivial, but, in Hollywood, vanity is business. An Oscar-nominated picture earns at least $12.7 million more at the box office than it would otherwise, Kalb said, and a bump in profitability of nearly twenty per cent across the lifetime of the film. The aim, then, is not just to get single Oscar votes but to influence influential people. And, in this, placement is key. Last summer, three computer scientists at U.S.C. published a paper called “The Majority Illusion in Social Networks,” which described, in mathematical terms, how limited behaviors can propagate based on who knows whom, and who is especially well-connected or popular. The scientists looked at two sets of fourteen nodes: structurally identical maps of theoretical social networks. Within each set, the scientists colored three of the nodes, then counted how many of the remaining nodes were immediately linked to the colored ones. 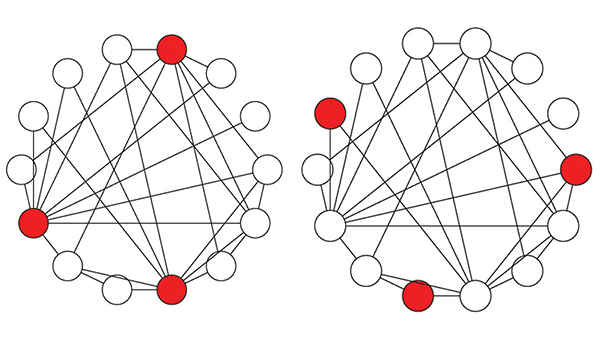 In one set, it was possible to link more than half the nodes with the colored three; in another, there were far fewer connections. The result, the authors write, is that “under some conditions, a large fraction of nodes will observe most of their neighbors in the active state, even when it is globally rare.” This is the majority illusion, and the researchers conclude that it can “dramatically impact social contagions.” In other words, it can be a helpful ingredient in buzz. Anyone who has survived high school has seen the phenomenon the paper describes: perceived popularity skews behavior. The well-connected red nodes (shown in the figure on the left) call to mind for me well-placed “For Your Consideration” billboards, even granted that the signs are inanimate. Their effect lies in a combination of location and language—their position at the heart of the entertainment industry, combined with the “Your.” Voters may receive the impression that the film is widely believed to be worthy of Oscar consideration and be encouraged to join the herd, while the talent may intuit that such marketing is everywhere and, compounding the vanity effect, increase their own efforts. I called Kristina Lerman, the lead author of the paper, to see whether there was anything to my theory. Lerman typically concentrates on cognitive biases in the online realm (the study cites Digg followers as one test case), and at first she was unconvinced by my I.R.L. interpretation. The billboards weren’t delivering limited information to a popular few, she told me. “They’re all over the city.” But I mentioned that, in fact, they were clustered around the studios, where the industry people are. Given that, she agreed that a well-targeted billboard could change perceptions among the powerful. By “saturating a relatively small environment with billboards, a voter might think … ‘This is an award winner’—even if it isn’t,” she said. Even so, Lerman suggested, the persistence of the billboards probably still had more to do with their success as a mnemonic—with the simple, cost-effective psychology that Cohen had described. “When people think of something, what comes to mind? The things they observe regularly,” she said. The billboards are a gentle nudge urging consideration from a powerful few, even as, for the rest of us, they mostly mark the season on a hot winter day.